Global research is looking at solar cells created using films that imitate the structure of the mineral perovskite. But only recently a team from Case Western Reserve University has directly demonstrated that the films bear an essential property enabling them to efficiently convert sunlight into electricity. Identifying that property could result in highly efficient solar panels. The researchers demonstrated that electrons produced when light strikes the film are unhindered by grain boundaries, which are the edges of crystalline subunits within the film, and travel great distances without weakening. Electric charge carriers that get trapped and waste away in other materials would now be available to be drawn off as current. The researchers directly measured the distance traveled, which is labeled as diffusion length, for the first time by using the method known as "spatially scanned photocurrent imaging microscopy." The diffusion length measured up to 20 μm within a well-oriented perovskite film. The research details have been published in the journal Nano Letters. The paper points out that solar cells could be built thicker without compromising their efficiency, said Xuan Gao, associate professor of physics and author of the paper. A thicker cell can absorb more light, potentially yielding a better solar cell. 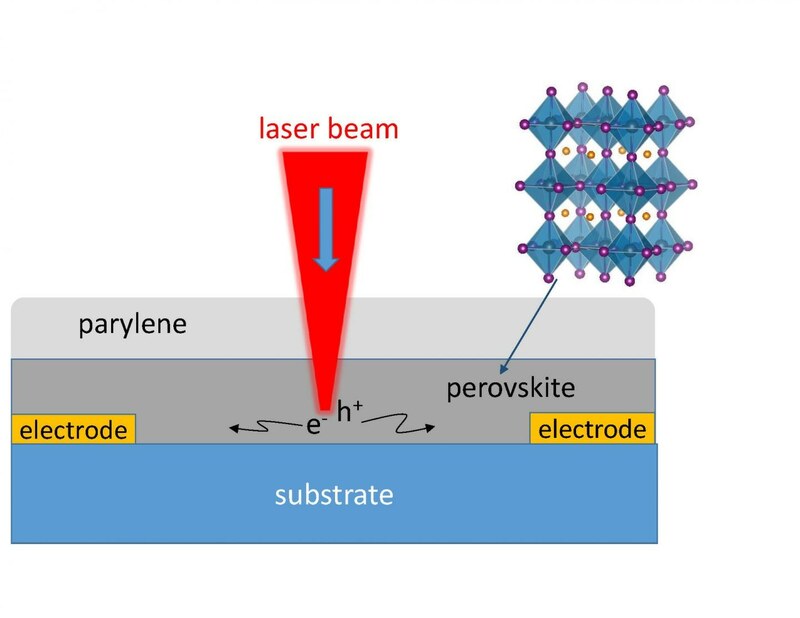 Researchers dealing with solar power think perovskite films hold enormous promise. Within five years, films manufactured with the crystalline structure have exceeded 20% efficiency in converting sunlight to electricity, a breakthrough that took several years to accomplish with silicon-based solar cells currently used. For this research, Gao's lab conducted spatially scanned photocurrent image measurements on films developed in the lab of Case Western Reserve chemistry professor Clemens Burda. Perovskite minerals in nature are oxides of specific metals, but Burda's lab created organo-metallic films with the same crystalline structure using methyl ammonium lead tri-iodide (CH3NH3PBI3), a 3D lead halide surrounded by small organic methyl ammonium molecules that keep the lattice structure together. The question has been, 'How are these solar cells so efficient? If we would know, we could further improve perovskite solar cells. People thought it could be due to unusually long electron transport, and we directly measured it. Diffusion length is the distance an electron or its opposite, called a hole, moves from creation until it rejoins or is extracted as electric current. The distance is the same as transport length when electric field (which typically increases the distance traveled) is not used. The labs conducted repeated measurements by focusing a miniature laser spot on films measuring 8 mm2 x 300 nm in thickness. By coating a layer of the polymer parylene on the perovskite, they stabilized the films. The light produces electrons and holes and the photocurrent, or stream of electrons, is recorded between the electrodes placed approximately 120 μm away from each other while the film is scanned along the length of two perpendicular directions. The scanning produces a 2D spatial map of carrier diffusion and transport attributes. The measurements revealed diffusion length averaged approximately 10 μm. In certain cases, the length touched 20 μm, indicating the functional area of the film is no less than 20 μm long, the researchers stated. In a few materials, grain boundaries reduce conductivity, but imaging revealed that these interfaces between grains in the film exerted no impact on electron travel. Gao and Burda explain that this could be due to grains in the film being well aligned, resulting in no impedance or other unfavorable effects on holes or electrons. Burda and Gao are currently seeking federal funds to use the microscopy method to establish whether varying grain sizes, film thicknesses, halide perovskite compositions, orientations, and more alter the properties of the film, to further speed up the research in the field.